Description: Southbound intermodal train Z-WSPALT9-29A speeds past the south siding switch in Norman. Description: Intermodal train Z-ALTKCK9-30 rolls through Norman in the early morning hours. Description: Havent seen one of these in a while. Description: Exiting Tunnel 35 on its way west. Description: Two of the three H1 dash9's on this train (one more in DPU on the rear) pull this stacker West through Saint Cloud. Description: Eastbound stacker with a pair of H1 Dash9's. 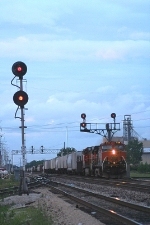 Description: A westbound Intermodal zips through Prairie du Chien on a nice summer evening. Title: BNSF 1012 heads Nb. Description: A H1 and a warbonnet lead a auto train west through Lockport.